Anita Hill reflects on a letter she received in the 1990s from a seventh-grader. In this letter, the author said, “It seemed Clarence Thomas had won. But he didn’t.” Hill emphasizes how it alluded to the media’s portrayal of her testimony. Photo by Camille Carrillo. A roaring round of applause welcomed to the podium the attorney and professor who put the issue of sexual harassment on the national agenda. 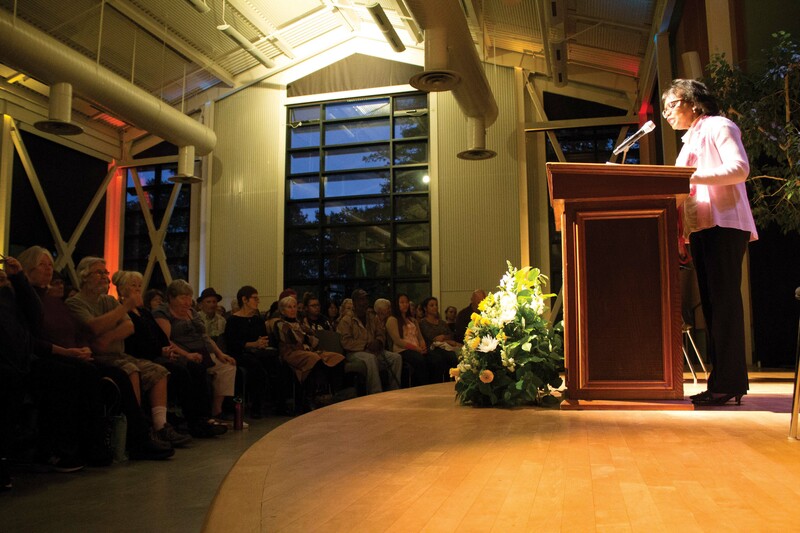 Students, staff and community members lined up hours before Anita Hill’s lecture — “Speaking Truth to Power: Gender and Racial Equality” — on Feb. 26 at UC Santa Cruz’s College Nine and Ten Multipurpose Room, filling the room to capacity. Hundreds more who were unable to secure a seat watched a live broadcast from the Humanities Lecture Hall. The evening began with Chancellor George Blumenthal welcoming the “powerful and towering” feminist studies professor Bettina Aptheker to the stage. Aptheker and literature professor Karen Tei Yamashita share the UC Presidential Co-Chair in Feminist Critical Race and Ethnic Studies, which organized the event. The youngest of 13 children, Hill is a Brandeis University professor of law, public policy and women’s studies at the Heller School for Social Policy and Management. “The change that we need — the change that we want — is a lifetime amount of work,” Hill said. Hill is the recipient of many awards and honorary degrees, including the Alphonse Fletcher Sr. Fellowship Award (2005), the Louis P. and Evelyn Smith First Amendment Award by the Ford Hall Forum (2008), an honorary degree from Massachusetts College of Liberal Arts (2010) and most recently, an honorary degree from Mount Ida College (2013). In response to Thomas’ infamous defense speech calling his hearing “a high-tech lynching for uppity blacks,” Hill called it a complete misappropriation of history. “They also allowed him to erase my racial history and the history of African American women who had been sexually abused and physically abused historically and totally erased and totally ignored by the Senate,” Hill said. The College Nine and Ten Multipurpose Room overflowed with 450 attendees, while those who could not enter the auditorium were asked to find a seat in the Humanities Lecture Hall to watch a simulcast of the event. Photo by Camille Carrillo. After watching the documentary “Anita: Speaking Truth to Power,” professor Aptheker said she decided “then and there” to bring Hill to campus. Events leading up to Hill’s lecture on Feb. 26 included film screenings of the documentary “Anita: Speaking Truth to Power” on campus and at the Nickelodeon Theater in downtown Santa Cruz. The screening on campus was followed by a panel led by Aptheker, assistant professor in Latin American and Latino studies Sylvanna Falcón and Title IX Director Tracey Tsugawa. 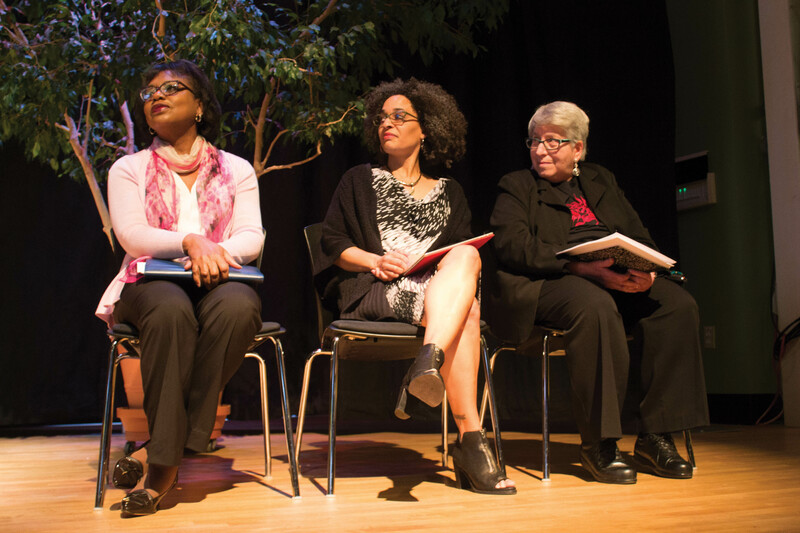 The panel mediated a discussion on campus sexual harassment.